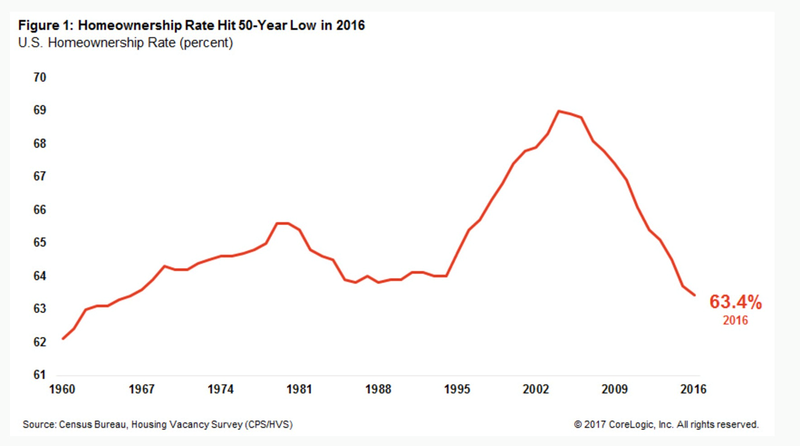 Last year, U.S. homeownership hit a 50-year low, with only 63.4% of the population owning their own homes. But starting this year, you’re going to see homeownership begin to tick upward. We’ve already begun to see this in 2017, where existing home sales have jumped to the highest point in a decade, according to the National Association of Realtors. The reason why January sales were so strong this year is because of millennials. The millennial generation is the group of Americans between the ages of 18 and 34. They are the largest generation in American history, numbering 92 million strong. And right now, the first wave of this generation has started to reach its peak buying years. This is a massive demographic trend that you’re going to want to take advantage of. One way to do this is to buy a housing-related exchange-traded fund (ETF), such as the one I told readers to buy back in February 2016 when I first highlighted this incredible opportunity. If you bought in back then, you’d be up over 28%. This ETF is the iShares U.S. Home Construction ETF (NYSE Arca: ITB), which has just broken out to a five-year high. If you didn’t buy in then, don’t worry. It’s not too late to get in. This housing trade is still in its early innings. « Previous The Next Market Disaster?